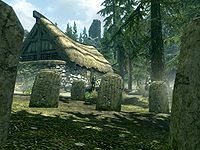 The Hall of the Dead is both Falkreath's only temple and home for both Runil, the priest of Arkay and Kust, who is responsible for looking after Falkreath's cemetery. The living quarters are at the northern end of the house, while the southern end is given over for a shrine and for devotions. It is found at the far western end of Falkreath with cemeteries all around. There is a shrine of Arkay on either side of the front porch entrance, as well as two tall posts with banners of Arkay hanging from them. Falkreath has been the site of many battles, helping to feed its massive cemetery. Many of the Nords see it as a grand honor to be buried there among the ancestors and heroes. The first time you visit Falkreath, as you approach the Hall, you will witness a funeral taking place for the daughter of Mathies and his wife Indara Caerellia. Asking about will reveal their daughter was brutally murdered. Runil, as the priest to Arkay, will be performing the service, while Sinding, the culprit is in Falkreath jail. Visiting and speaking to Sinding gives you the option to initiate the related quest. There are several nightshade plants and fungi growing among the gravestones around the hall. It is a single room house. In the middle of the south wall there is a shrine of Arkay, with a wooden bench and a couple of chairs in front and a couple of barrels in the corners. Opposite the door is a long wooden table and bench, the table holds a chicken's egg, two pine thrush eggs, a bottle of Nord mead, a bottle of alto wine and a bucket containing three potatoes. Above the table is a rack with three rabbits and three pheasants hanging from it and three garlic braids, two bunches of elves ear and a bunch of frost mirriam hanging from the ceiling beside it. To the right of the table is a fireplace with a kettle containing two leeks on the hearth and a round wooden table and two chairs in front of the fire. This table holds a bottle of alto wine, one of wine and two loaves of bread. Coming out from the north wall are two owned single beds with an end table between them and an unlocked chest containing minor loot at the foot of the left-hand one. On the end table is a bottle of Nord mead and a copy of Aedra and Daedra. Against the east wall is a wardrobe containing common clothes and having a steel mace on top, a food barrel and a dresser with more clothes in. On the dresser are two more pine thrush eggs, four bulbs of garlic, two bunches of frost mirriam, two bunches of elves ear and a bottle of Black-Briar mead, with three garlic braids and a bunch of each frost mirriam and elves ear hanging from the ceiling above the dresser. A copy of the Conjuration skill book The Doors of Oblivion can be found under the left-hand bed. The Falkreath Hall of the Dead also appears in Legends, in The Fall of the Dark Brotherhood story expansion. This page was last modified on 22 October 2018, at 19:45.